Kidnapping: that is the claim of a family who had their children taken by the state, despite the fact they broke no laws. Over 9 months their children have been held in custody of Kansas, even though they live in Colorado. Shona Banda is not the only parent to have their child stolen fro them in the state of Kansas. Raymond and Amelia Schwab are medical marijuana patients in the state of Colorado. A case of alleged child abandonment was placed against the family, but its findings were proved unsubstantiated. The state refuses to give the children back, focusing on the legal medical marijuana that the parents use, not in Kansas, but in Colorado. Raymond Schwab is a disabled veteran who served during the Gulf War. He has PTSD and chronic pain while his wife Amelia has rheumatoid arthritis and spinal stenosis. Amelia’s conditions are so painful they often leave her bedridden. Amelia is allergic to prescription pain-killers. They received their recommendations for cannabis from a licensed physician in Colorado where they lived until Raymond received a job at the V.A. office in Topeka, Kansas in 2013. Last summer, Raymond was able to get a transfer to the V.A. in Denver, and the parents left the children in the care of a relative while the packed up the household goods to move back to Colorado. A dispute with the family member led to a call to the Riley County Police Department in Manhattan, Kansas, claiming the children abandoned. This put the children into emergency custody without contacting the parents. The relative regrets the action, and has reconciled with the Schwabs, but the state of Kansas refuses to give the children back, even after the case of abandonment was proved false. Kansas has held the children for over 9 months. They demanded the Schwabs submit to psychological testing, parenting classes, drug tests, and stop their legal use of cannabis – even though they are legal residents of Colorado, not Kansas. To all these conditions, the Schwabs have complied, but still the state holds the children hostage. Raymond is forced to go back to a dangerous mix of painkillers, muscle relaxants, and anti-anxiety drugs to treat his conditions while Amelia’s allergy prevents her from receiving any relief. The state of Kansas increasingly focuses on the Schwabs use of cannabis as their reason for not allowing the children to return home, yet because the Schwabs live in Colorado, it is perfectly legal for them to do so. When they lived in Kansas, and Raymond worked for the Federal Government there, they did not use cannabis. Why is Kansas trying to force its backward laws onto families that are not living in it? How can this unlawful kidnapping of children be allowed? 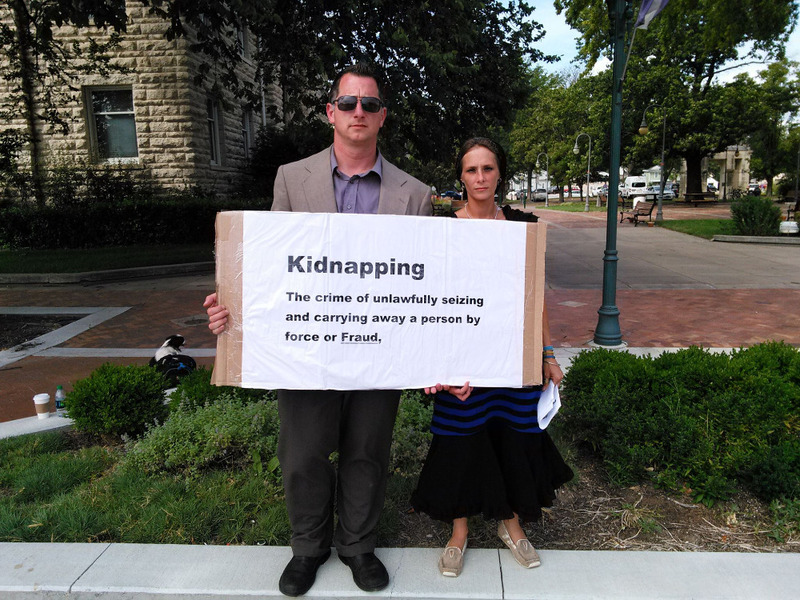 These are the questions that Raymond and Amelia are fighting to have answered, with their ongoing legal battle now in the Kansas Court of Appeals. The Schwabs have recently launched a GoFundMe campaign to raise money for their legal fund because of course the state can use taxpayer funds however it sees fit, while citizens must pay to have their voices heard. Raymond and Amelia plan to file a federal lawsuit against the state of Kansas the Kansas Department for Children and Families, the Riley County Police Department, and the Prosecutor’s Office. “I want to sue them and utilize those funds to continue to help parents and families. We were starting our own care giving organization here [in Colorado] so I could work with veterans and start making cannabis oil so we could start getting medicine to people, and we’ve kind of put a hold on all of that because of what’s going on. How would you feel if the state you lived in took your children when you had not broken any laws? Share your thoughts with us on our social media page or in the comments section below.